I did not think that Paul could top the huge igloo he built during the big snow of 2014. But he outdid himself this year by building a bobsled run in our front yard. He banked up the sides, and we used a snow tube. I am not much of one for hanging out in the snow. But once I went down one time I was hooked, and so were the boys. It was wicked fast. The second day, it got even faster, and we started making the boys wear helmets to go down. It was the most fun I remember having in a very long time. No way can Paul outdo himself next year! This was just too much fun. I will have more pictures in the near future. That looks like such a blast! You do realise you've given Paul a challenge for next year, right? Most fun in the snow? Wellll, I'd have to say it was the year my brothers decided to re-create a traditional Scandinavian sauna, complete with jumping in the icy creek... naked as jaybirds. My grandfather later reported that they shrieked and turned blue, rather like pre-Smurf Smurfettes! Guess *I* didn't have fun in the snow with that one, but it involves snow and it made me laugh for ages; still does. If you see him building something this summer, it might be a ramp or maybe a loop for next winter! Get a good pack and it goes faster. I spray cooking spray on my sleds to get them faster. Looks like fun! But also scary. Bobsledding is on my "do not fly" list along with skateboarding, rock climbing and jumping-off-the-roof-for "fun". oh, so COOL!!! don't forget to link in, dearie! or let me know if you'd like me to do it for you! Picture proof, winter is a blast! You captured it wonderfully! How long did it take him? What a genius idea! It will be sad to see it melt, I hope it is in the shade. A picture of sheer joy. That does look like fun! I haven't done anything lately. The snow we had this year was more like ice. I did like building a snowman with the boys a year ago. Oh what fun!! I bet the boys enjoyed that immensely! When my kids were little and home, we had fun in the snow. But now they are gone snow is just another logistical problem to deal with. Sledding is the MOST fun! Love that huge grin! Oh, that looks like fun! Wheee! That certainly looks like a blast for the whole family! How cool! 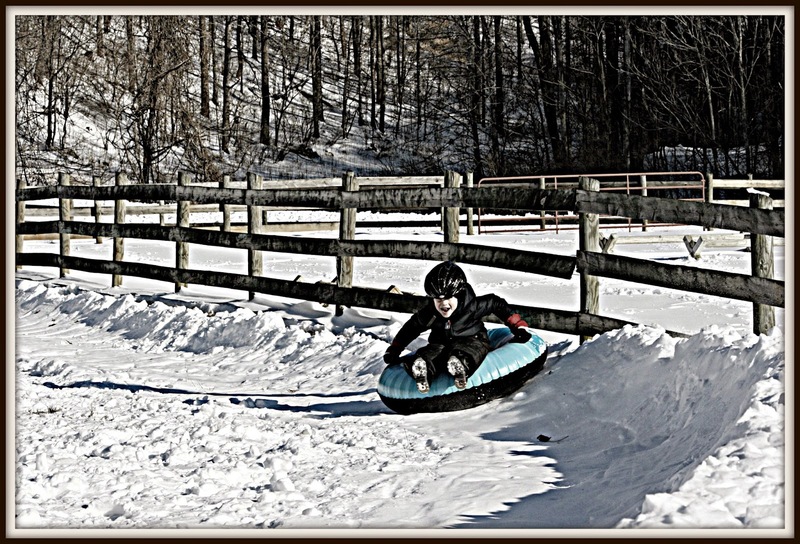 We had a lot of fun in the snow this year too, with tubing, sledding, and good old fashioned snowball fights. We never tried making a bob sled though! Oh yes, that looks like great fun! SWEET! I would have LOVED that! Maybe an ice rink next year? I always wanted to do an ice rink in the yard. Terrific idea! What a blast! yep looks like a great time was had by all. Hello, Just got home from a nice trip to Arkansas to celebrate George's birthday. I will blog about it tomorrow. Now--it's time to start working in the yard, cleaning up all of the 'junk' from the ice storm. What a mess!!! That looks awesome!!! It doesn't snow here. I've never experienced that kind of winter fun. Something that I can't find the real here. Thick snow... such a lot of fun playing on the white snow. Sounds like fun to me... I am hoping when I get home from Las Vegas that all the snow is gone.